Mica, sometimes referred to as bookstone, is a silicate mineral found throughout the world. You will learn how to use and recognize both natural and composite forms of mica. 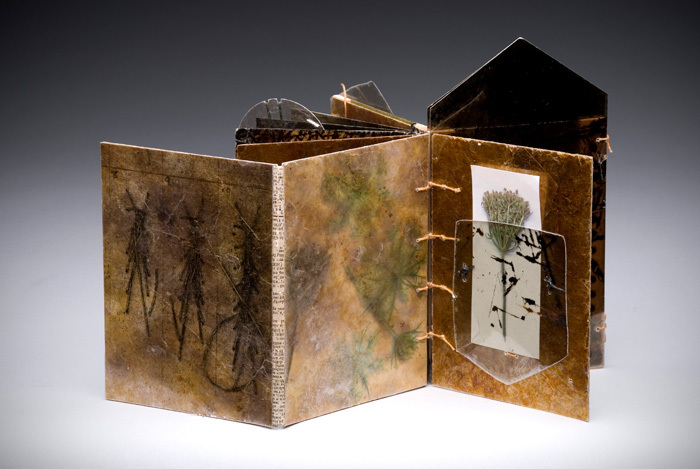 This workshop will explore creating and collaging book pages made primarily from mica, pushing beyond using mica as just a small element in book arts. Our main focus will be manipulating composite mica used in the lampshade industry. These sheets of mica come in several colors, depending on the variety of mica and the binder that holds the sheet together. We will construct our mica pages exploring various techniques that emphasize the unique qualities of mica. I will teach an elegant Coptic binding, as well as hinging methods that will enable you to push your book into a more sculptural form. Thin or light weight collage materials: decorative papers, photos, insect wings, sheet music, old book pages, leaves, feathers, etc. High contrast imagery generally works best. Some collage materials will be provided, however, personal collage materials that you collect and bring along is highly encouraged.